Seed tape has become increasingly popular in the last few years, and it’s easy to see why. 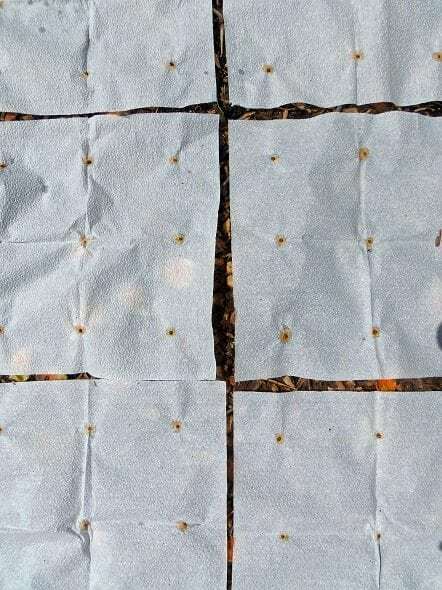 Just lay it out on your garden bed, and your seeds are perfectly spaced – even those teeny tiny ones that are so hard to work with. The only real downside to seed tape is that it costs more than a pack of seeds, and comes with fewer seeds. Happily those are easy problems to dodge, if you’re willing to make your own (which is just what I do). 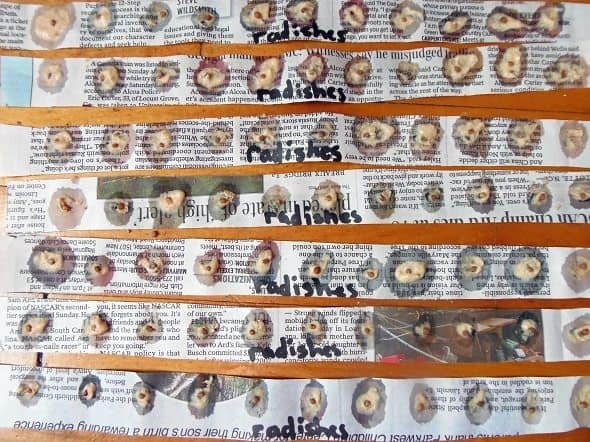 Want to make your own seed tape, too? Here’s how it’s done. 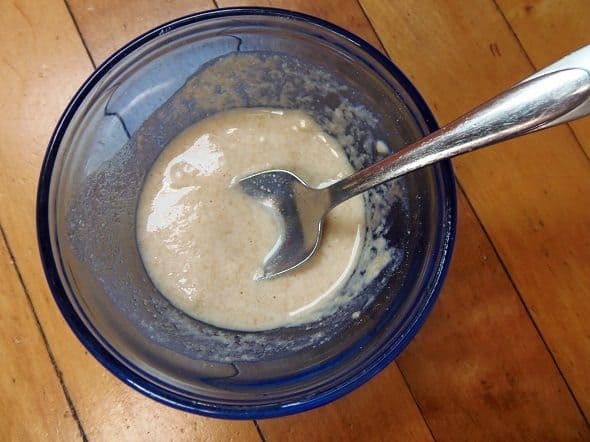 Add a bit of water to some flour to make a thick paste. This is just like the paste that you’d use for papier mache. 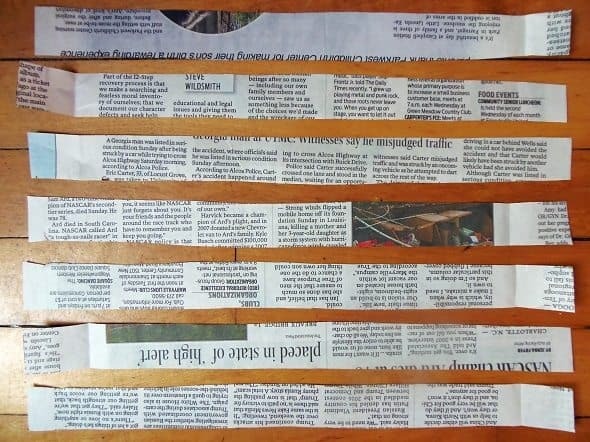 Then, cut a newspaper into one-inch wide strips. If you’re a square-foot gardener, I recommend making your strip 12-inches long. 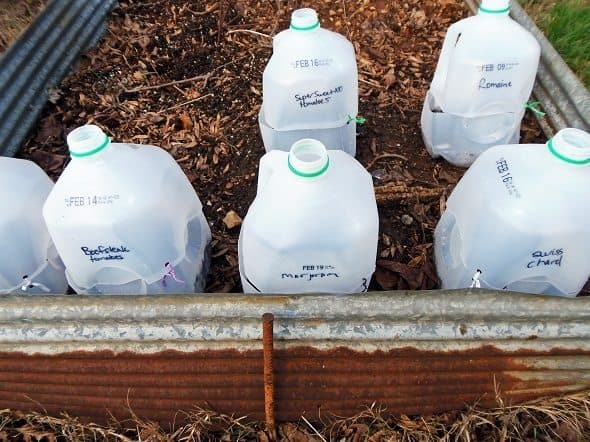 This will save you time when you’re planting. 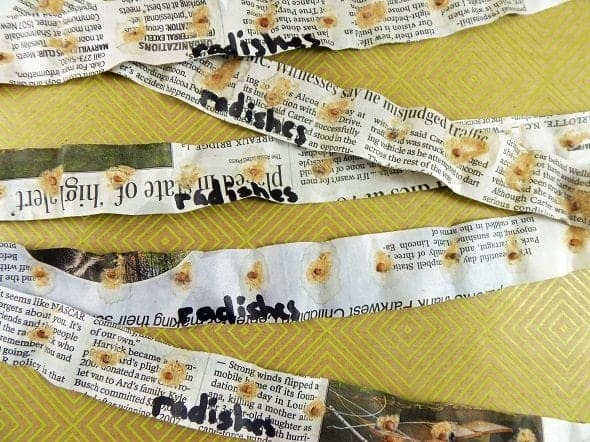 Label your strips with the type of seed that you’ll be using. 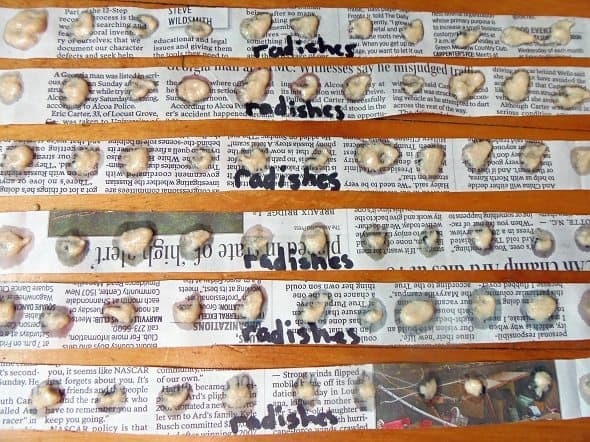 Then, make a dot everywhere a seed needs to go (refer to the seed packet for proper spacing). 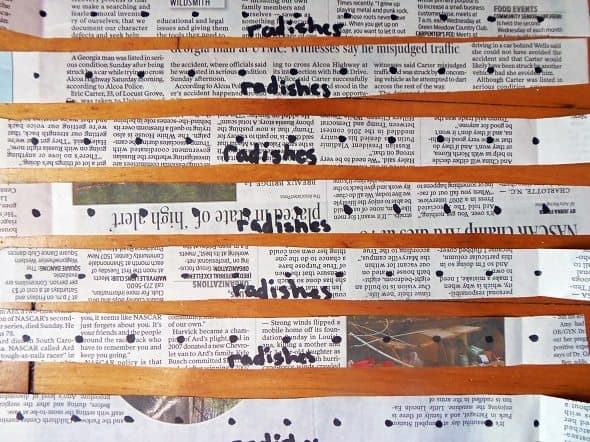 Radishes are supposed to be spaced one-inch apart, so I made a mark every inch. Apply a dot of paste to each spot that you marked. You can use the back of a pen or your finger to do this. Then, press a seed into each paste dot, and allow your seed tape to dry. 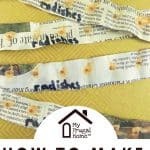 Plant your seed tape out in the garden, or roll it up and store it in a plastic bag until you’re ready to plant. 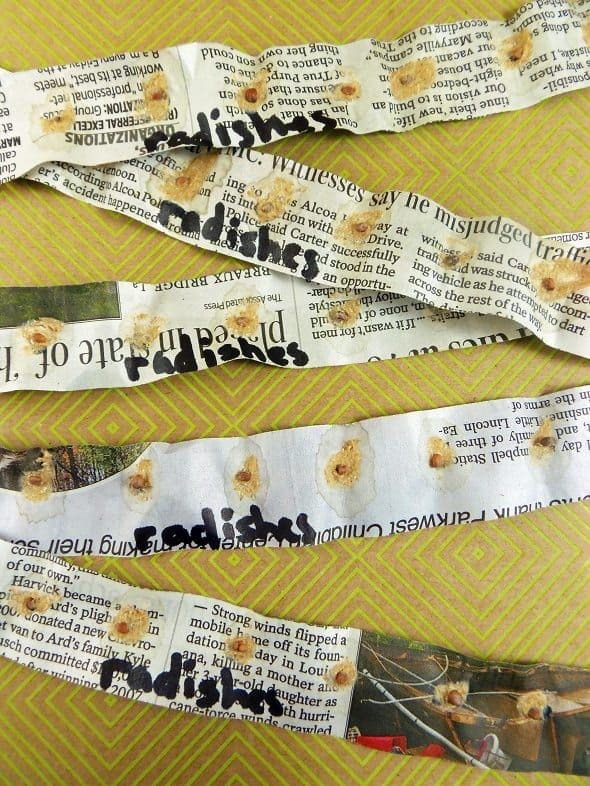 The newspaper and flour will biodegrade over time, without causing any harm to the seeds. Great idea, I will try this technic shortly. Thanks abunch. Great idea. I hate thinning. This will be a helpful item for my grandchildren to make this summer. I’ll use them in the fall garden. How many inches for planting cantaloupe? I saved the seeds from a cantaloupe I bought last year. 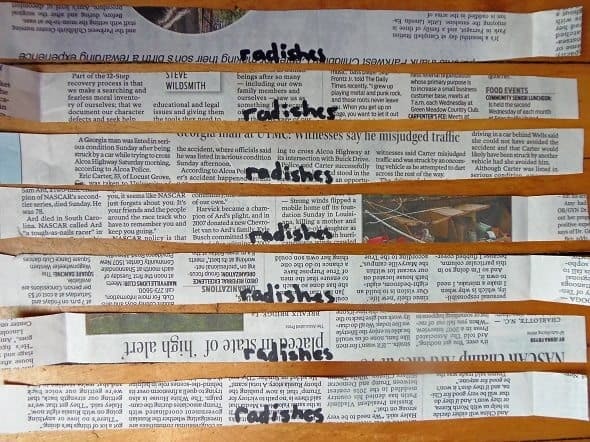 I want to make a seed tape from your newsletter. Is there a way I can print your suggestions?